Knopf Books for Young Readers, 9780553512274, 48pp. 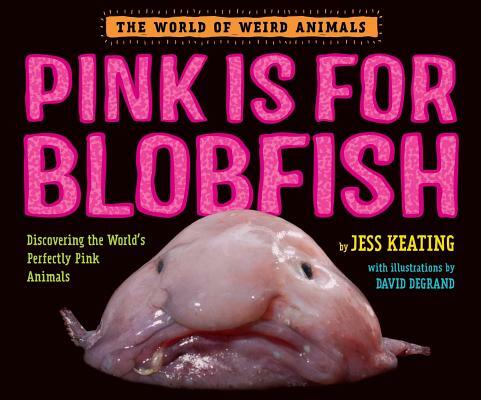 Pinkalicious meets National Geographic in this nonfiction picture book introducing the weirdest, wildest, pinkest critters in the animal kingdom! Some people think pink is a pretty color. A fluffy, sparkly, princess-y color. But it's so much more. Sure, pink is the color of princesses and bubblegum, but it's also the color of monster slugs and poisonous insects. Not to mention ultra-intelligent dolphins, naked mole rats and bizarre, bloated blobfish. Isn't it about time to rethink pink? Slip on your rose-colored glasses and take a walk on the wild side with zoologist Jess Keating, author of How to Outrun a Crocodile When Your Shoes Are Untied, and cartoonist David DeGrand. Jess Keating is a zoologist-turned-author who writes with the sort of wisdom you can only get from multiple crocodile bites and skunk sprays. Jess has been making up stories for as long as she can remember, and at the age of eight, she even started a library in her room (mainly so she could charge her brother late fees). In addition to nonfiction, she writes middle-grade novels, including the Kirkus-starred How to Outrun a Crocodile When Your Shoes Are Untied. Jess lives with her husband in Ontario, Canada, where she is hard at work on her next book in the World of Weird Animals series. Hint: There will be bloodsuckers!